Many of our customers know that if viewed as a comprehensive imaging system, our Terahertz imaging line scanner should include a THz source. 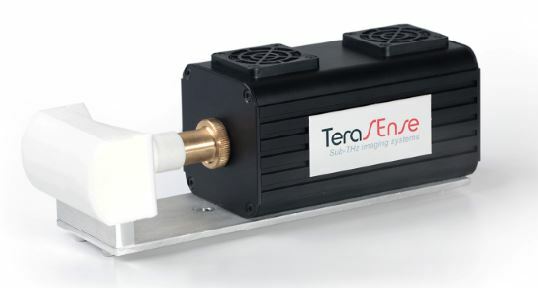 After months of hard work and intensive R&D efforts, TeraSense is pleased to announce the release of new THz wave-sources based on IMPATT technology. One of these new Power sources, as they were informally dubbed, can brag a power output of 330mW! These new concept powerful THz sources Type-II and Type-III were meant primarily for our TeraFAST THz imaging scanner and therefore include our novel THz optics based on metallic reflection mirror instead of the PTFE lens still employed with Type-I Thz source. As many current users of our TeraFAST-256-HS THz imaging scanner know Type-I -THz source diode for line scanner with PTFE lens is our existing ‘conventional’ solution, which we’ve been offering for more than a year. Type-I source for line scanners has a horn antenna tuned with integrated PTFE lens to spread THz radiation evenly over the inspection area. It is the special configuration of its complex PTFE lens that ensures proper focusing of THz beam and diffusion of THz emission to create a linear backlight with a uniform intensity distribution. Type-II- THz wave-source for line scanner is an upgraded version of THz source with totally revamped terahertz optical system. It has absorbed our most recent breakthrough in THz beam focusing arrangement that enabled achieving enhanced performance of imaging scanner. Type-II source includes our novel THz optics created based on specially configured high gain horn antenna in combination with a metallic mirror (instead of the PTFE lens used with Type-I). 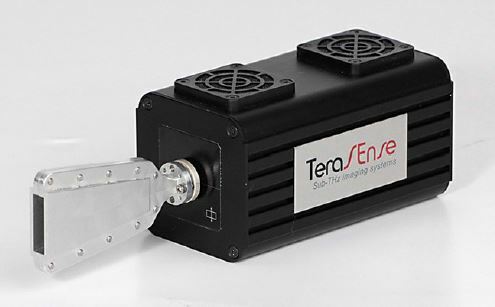 Type-II source considerably improves THz imaging capabilities of our line scanners by increasing the amount of incident THz emission reaching the sensor array. Its power per pixel is x4 times higher than the same value measured for type-I. As if this was not enough, we complemented that ‘variety’ with a Type-III THz generation module, which is a true super ‘giant’ if compared to others. In terms of actual power output 330 mW the Type-III generator equals four regular IMPATT diodes put together, which in combination with its novel THz optics yields Incident signal improvement factor of x16 (versus Type-I) and surely improves the quality of THz image. 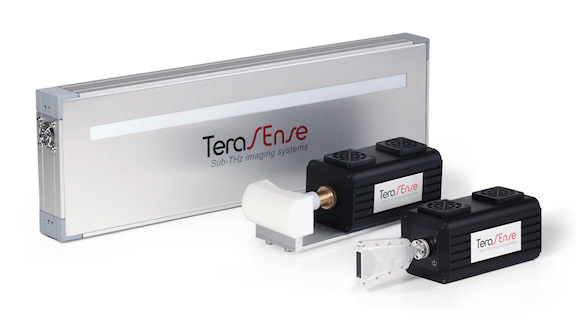 Thanks to one more important breakthrough we have successfully made, Terasense can now offer a whole assortment of THz generation modules for our TeraFAST-256-HS high speed THz imaging scanner, each with a different THz optical system. Each type of THz sources for line scanners has it strong points, is priced individually and can be ordered independently of THz imaging scanner. We hope you feel intrigued and will be happy to tell you more if your CONTACT US using the form below .